However, I evidently remain optimistic of a full recovery since I have entered another race. This one is a long way off though, it’s not until November 2011. I entered it now because 80% of the available places are already taken and I didn’t want to miss out. I still intend to do the Gobi desert next June, but will register for that at a later date. So, what have I entered? Racing the Planet: Beyond 4Deserts – Nepal. Nepal is a place I’ve always wanted to visit anyway, so this is a perfect excuse and a perfect way to visit. What better than a semi-guided 250km foot tour? The course details have not yet been finalised, but the race starts near to Pokhara, via an internal flight from Kathmandu. 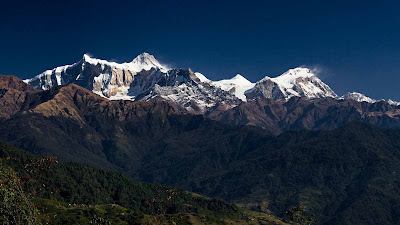 Pokhara which is a popular destination for people doing the Annapurna Trail. The race won’t be following the Annapurna Trail itself, which is coincidentally a similar distance, but it will almost certainly take elements of it in. The Trail itself goes to up 5500M, an altitude at which no one would be able to run, and most would be struggling to conjour up more than a very slow walk. That’s not to say the event isn’t going to be tough as it still states that we will be at altitudes of up to 11,000ft, which is getting on for 3400M. That is a similar altitude to the Atacama Crossing I took part in, in March this year. I spoke to the course director who explained some of this, and also that accommodation for the event is more than likely to be in the local tea houses and as well as some camping too. The race will be supported by Sherpas, who will I imagine be making and striking the camps where applicable. I believe that apart from that, the format will be similar. It is still likely to be self sufficiency, though I imagine that this event will be a little different. I imagine there are tea houses all along the route, so it would be practically impossible to stop people buying bits and pieces if they wished. I read that usually if you stay in a tea house, the cost of the stay is usually very cheap because you are expected to buy evening meal and breakfast, which I assume won’t apply here. I guess RTP will have negotiated that we can stay, and they only provide hot water to us (for dehydrated meals etc). I don’t know this for certain at the moment, it’s a combination of what the race director mentioned at this early stage of planning and my guesswork. I mentioned the course had not yet been finalised, as the course director has yet to make further visits and view some new trails that are opening. He did mention that on one day the intention was for the course to climb up to a popular viewing area of Annapurna itself. Running in an area dominated by 7&8000M peaks will undoubtedly be spectacular, and that’s the main attraction for me to be honest. Temperatures in November are said to be typically 25-35C in the day, so hot but not desert hot. I expect the main challenges to be the altitude and terrain. There is a possibility the ‘long day’ could be earlier; on day 2 or 3, but again that’s not confirmed at the moment. It sounds an exciting challenge is perhaps the most spectacular area on the planet. If you haven’t already signed up then you’d better do so before it sells out, which is likely to be fairly soon! Plenty of my friends, past 4deserts event competitors are already signed up to, so it’s going to be a great social occasion as well. I’m looking forward to it, I just need to get myself right in the short term. I hope to maybe take part in a short event in a couple of weeks but it’s all dependant on my knee right now. Have a good week!